Beckenham Chorale is a mixed voice choir of about 80 voices founded in 1960 and affiliated to Making Music and the Bromley Arts Council. 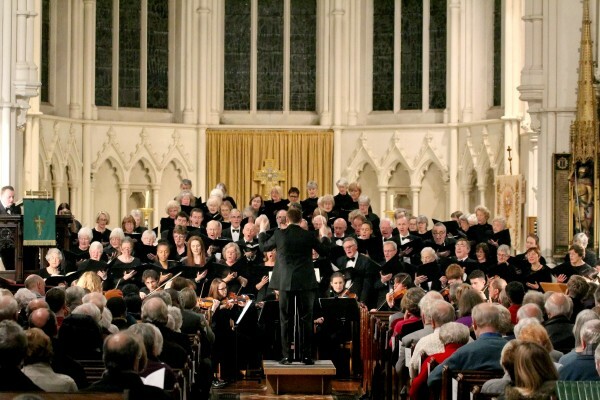 It gives three concerts a year at St George’s Church Beckenham and rehearses each week broadly through the school year at the St George’s Church Hall. The Chorale engages professional soloists and orchestral instrumentalists, with whom we have a long association, to perform with the choir. Mark studied at Trinity College, Cambridge and the Royal College of Music and began his career as a professional singer. He has been Musical Director of the London-based chamber choir Coro since 2003, conducting them to international competitive success, in regular concerts throughout Britain and Europe, and on radio and CD. He also works with large symphonic choruses including the Philharmonia Chorus and the Brighton Festival Chorus. Mark has a wealth of experience with younger singers, too, as Director of the award-winning Berkshire Youth Choirs and a music mentor for the National Festival of Music for Youth, and is currently Director of Choirs at the Junior Department of Trinity College of Music. He has also directed the Young Conductors’ Course for the Association of British Choral Directors.